Today on the blog I have swatches of the amazing textured nail polishes called Pixie Dusts by Zoya. These are for summer 2013 and they are full of bright cheery colors. Here's a collage of all the beauties in this collection. Please click Read More below to view individual swatches and read my review. This is sort of a pink near light red polish. Love the color, love the finish. Next is Zoya - Beatrix. Orange and yummy looking. Careful though, this is a nail polish, so do not lick. Lol..
Look at this up close picture! Next is Zoya - Destiny. This polish was certainly destined to freak out my camera. Lol.. I couldn't capture its true color for the life of me. Think Coral with sparks. and a tiny bit red undertone. Oh Such a beauty. Blue perfection. I blogged about this in THIS POST for Autism awareness. Love the name and the color. GOLD. Straight up on your nails. 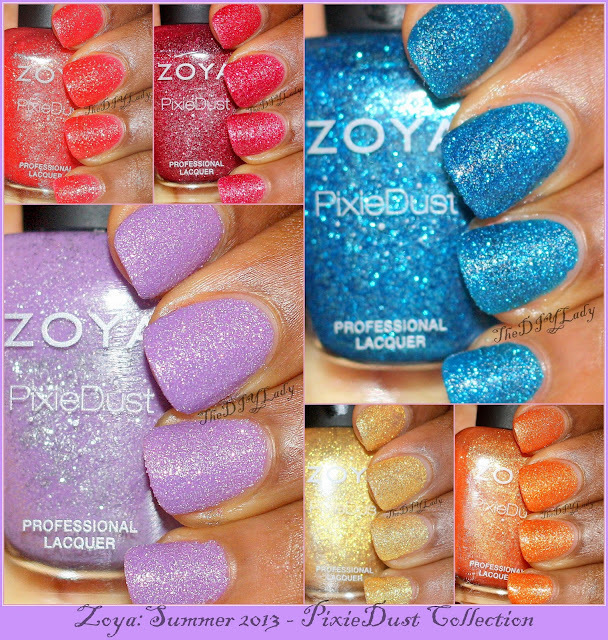 And last but certainly not the least is the polish that made me excited for this whole Pixiedust Summer Collection. And since I wanted to do something with these beauties, I opted for a tape mani. I started off simple with just an accent nail. Using Miranda in a diagonal tape mani. I had no goal in mind and I think that's very evident in my result. Lol..
Well, That's it for my swatches, review and nail art. These have an amazing formula, they were all opaque in two coats, and dried to the matte textured finish. I wore Stevie for 4 days straight and only had minor tip wear. That's great! Nothing is as amazing as Textured, Matte, Sparkly, long lasting goodness. Want to try Zoya Polishes? You can get these zoya Polishes at $8 each on Zoya's Website or at your local ULTA stores. When you make a new account by clicking the link above, you'll automatically get a coupon in your account that can be redeemed for a free Zoya nail polish of your choice. Just pay shipping. Or add two more polishes to your cart and get shipping free for all. Zoya's facebook page is always booming with fun and lots of swatches by Zoya fans. So be sure to "like" them. Whoe! i love those!!! beautiful swatches! Wow, they're all so beautiful. I'm definitely loving Stevie though! Yes, Purple lovers unite! lol..
Lizzy, these were made for you :) You wear Solange just beautifully. Thank you sugar. She's a beauty. I can't even lie. Sparkles so well! I love them all. Removal is a great surprise. Easier than expected is a bonus!! Freebie Alert: Get $10 worth at JCP for FREE.